Glycopeptides are a large class of naturally occurring molecules containing a carbohydrate glycosidically linked to an a-amino acid, which is typically a component of a peptide or protein. There are both N- and O-linked glycopeptides. N-Acetylga-lactosamine linked a to serine is the major O-glycosidic linkage, whereas N-acetyl-glucosamine linked ^ to asparaginine characterizes N-linked glycopeptides (Fig. 1) . contained 2-amino-2-deoxymannuronic acid , and shortly thereafter, Hemophilus influenzae type d was shown to contain 2-acetamido-2-deoxy-d-glucuronic acid . 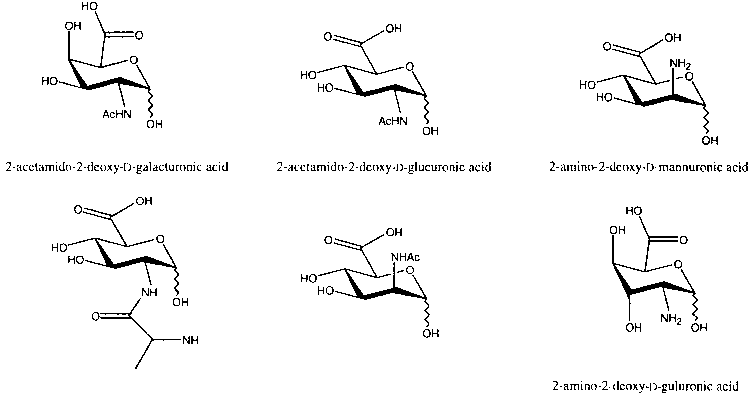 At about the same time, an antigenic staphylococcal polysaccharide was shown to be composed of 2-acetamido-2-deoxy-glucuronic acid glycosidically linked to 2-[(V-acetylalanyl)amino]-2-deoxyglucuronic acid (Fig. 2) . It would appear that this was the first identification of a naturally occurring sugar amino acid amidically conjugated to an a-amino acid . All possible hexose configurations have been found as amino hexuronic acids in bacteria, with the possible exception of idose . In some cases, more than one hydroxyl is replaced by amine functionality; for example, 2,3-diamino-2,3-dideox-yglucuronic acid was isolated from the cell wall of Propionibacterium acnes . Several more polysaccharides containing hexuronic acids linked to a-amino acids such as alanine, serine, and threonine have been characterized . There are also examples of amino sugars linked to the carboxy terminus of a-amino acids (Fig. 3) . Ezomycin A1 and gougerotin are natural nucleoside antibiotics comprising sugar amino acids conjugated to a-amino acids through amide bonds. Ezomycin A1 contains two pyranoses, both having y-amino acid functionalities, whereas gougerotin is a carbohydrate-based ^-amino acid (Fig. 4) . Ezoaminuroic acid was the first naturally occurring 3-amino-3-deoxy-hexuronic acid to be identified . Structure elucidation studies, chemical syntheses, and biochemical properties of these and related compounds have been reviewed [13,14]. Amino glyculosonic acids are members of another class of sugar amino acids that are 2-keto sugars with a C1 carboxylic acid. One of the most abundant representatives of this class of molecules is neuraminic acid, a nine-carbon sugar amino acid. There are several known derivatives of neuraminic acid, which are collectively called the sialic acids . They are components of bacterial and viral capsular polysaccharides, and they are important constituents of mammalian cellular recognition elements. Besides the sialic acids, two other amino nonulosonic acids have been isolated from bacteria. These compounds are 5,7-diamino-3,5,7,9-tetradeoxy-nonulosonic acids. The amine functionalities of pseudaminic acid (Fig. 5) have been found acylated, formylated, and conjugated to serine in nature . Several syntheses targeting amino hexuronic acids have been reported. Heyns and Paulsen synthesized the first sugar amino acids in 1955 . In the event, benzyl-2-V-carbobenzyloxy-2-deoxy-a-d-glucopyranoside was reacted with oxygen and platinum to provide 2-jV-carbobenzyloxy-2-deoxy-d-glucuronic acid, which after removal of the nitrogen protecting group yielded a ô-sugar amino acid (Fig. 6). 2-Amino-2-deoxy-galacturonic acid was prepared in a similar fashion . It is noteworthy that these synthetic efforts predated the identification of sugar amino acids in nature.